Bluetooth has become an important part of our lives. However, it is a reliable technology. It is rare but sometimes you may have Bluetooth problems. 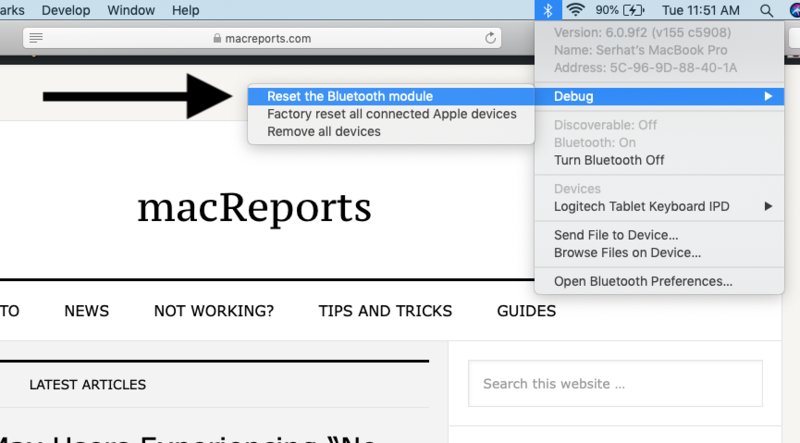 Several Mac users have reported that they occasionally encounter a random loss of Bluetooth functionality. Users further have said that Bluetooth menu displays a “Bluetooth: Not Available” error (see image below). You may run into problems establishing a Bluetooth connection or using a Bluetooth accessory. And this will cause your Bluetooth devices and accessories to stop working. And furthermore, several macOS and iOS services (AirDrop, Handoff, Continuity etc) will not work properly if you are having issues with Bluetooth. Bluetooth technology lets you wirelessly connect various hardwares (keyboard, mouse, trackpad, headset etc) to your Mac by associating them with your computer (also called pairing). Once paired, your Mac connects to these tools if Bluetooth is working. This article explains what you can do to troubleshoot when Bluetooth is not working. Please try each step until your issue is resolved. After each step, check to see if Bluetooth is working. Please also note that performing some of the methods below will cause you to temporarily lose connection to your connected devices (e.g., keyboard, mouse etc). So you may want to use a wired device. If you do now see the Bluetooth icon in the menu bar, go to System Preferences > Bluetooth and check the “Show Bluetooth in menu bar”. You may think that Bluetooth seems to be not working because your Bluetooth device stopped working. It is simple that your device battery is running very low, if it uses battery. Make sure that your Bluetooth accessories has enough battery life. You may want to change the batteries or charge the device. Make sure that Bluetooth device is turned on. Make sure that your Bluetooth device and Mac are close to each other. Restart your Mac. Simply restarting your Mac may fix your problem. Disable and enable Bluetooth. Disable Bluetooth and wait several seconds and then turn it on. Remove all USB devices (mouse, keyboard etc) and then reboot your Mac and then reconnect them. In Finder, press the Command+Shift+G keys together. This will reveal the “Go to the folder:” window, then enter the following and hit go. Try the find the “com.apple.Bluetooth.plist” and “com.apple.Bluetooth.plist.lockfile” files. And delete these files. This files could be corrupted and cause problems. You may be asked for a admin password. (if you want, copy these files to somewhere else as a backup before removing). Reset your Mac’s SMC. This is done differently depending on the Mac models. Apple’s documentation explains how this is done. If none of the methods above work, you may want to contact Apple support. You may also want to make a Genius Bar reservation.